The Surface Enterprise Management Mode (SEMM) feature of Surface UEFI devices allows administrators to both manage and secure the configuration of Surface UEFI settings. For most organizations, this process is accomplished by creating Windows Installer (.msi) packages with the Microsoft Surface UEFI Configurator tool. These packages are then run or deployed to the client Surface devices to enroll the devices in SEMM and to update the Surface UEFI settings configuration. For organizations with System Center Configuration Manager, there is an alternative to using the Microsoft Surface UEFI Configurator .msi process to deploy and administer SEMM. Microsoft Surface UEFI Manager is a lightweight installer that makes required assemblies for SEMM management available on a device. By installing these assemblies with Microsoft Surface UEFI Manager on a managed client, SEMM can be administered by Configuration Manager with PowerShell scripts, deployed as applications. With this process, SEMM management is performed within Configuration Manager, which eliminates the need for the external Microsoft Surface UEFI Configurator tool. Although the process described in this article may work with earlier versions of System Center Configuration Manager or with other third-party management solutions, management of SEMM with Microsoft Surface UEFI Manager and PowerShell is supported only with the Current Branch of System Center Configuration Manager. You will also need access to the certificate that you intend to use to secure SEMM. For details about the requirements for this certificate, see Surface Enterprise Management Mode certificate requirements. It is very important that this certificate be kept in a safe location and properly backed up. If this certificate becomes lost or unusable, it is not possible to reset Surface UEFI, change managed Surface UEFI settings, or remove SEMM from an enrolled Surface device. Management of SEMM with Configuration Manager requires the installation of Microsoft Surface UEFI Manager on each client Surface device. You can download Microsoft Surface UEFI Manager (SurfaceUEFIManager.msi) from the Surface Tools for IT page on the Microsoft Download Center. After Microsoft Surface UEFI Manager is installed on the client Surface device, SEMM is deployed and managed with PowerShell scripts. You can download samples of the SEMM management scripts from the Download Center. Deployment of Microsoft Surface UEFI Manager is a typical application deployment. The Microsoft Surface UEFI Manager installer file is a standard Windows Installer file that you can install with the standard quiet option. Open Configuration Manager Console from the Start screen or Start menu. Click Software Library in the bottom left corner of the window. Expand the Application Management node of the Software Library, and then click Applications. Click the Create Application button under the Home tab at the top of the window. This starts the Create Application Wizard. General – The Automatically detect information about this application from installation files option is selected by default. In the Type field, Windows Installer (*.msi file) is also selected by default. Click Browse to navigate to and select SurfaceUEFIManagerSetup.msi, and then click Next. The location of SurfaceUEFIManagerSetup.msi must be on a network share and located in a folder that contains no other files. A local file location cannot be used. 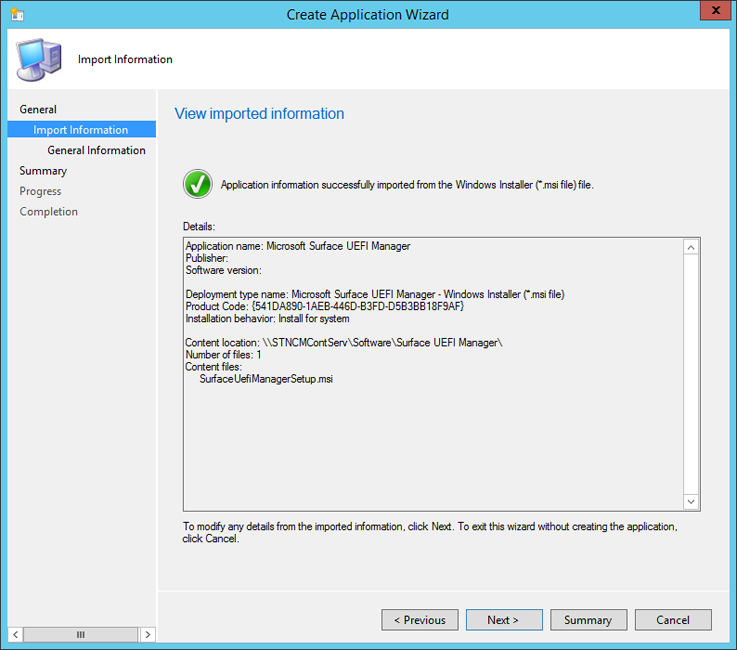 Import Information – The Create Application Wizard will parse the .msi file and read the Application Name and Product Code. SurfaceUEFIManagerSetup.msi should be listed as the only file under the line Content Files, as shown in Figure 1. Click Next to proceed. General Information – You can modify the name of the application and information about the publisher and version, or add comments on this page. The installation command for Microsoft Surface UEFI Manager is displayed in the Installation Program field. The default installation behavior of Install for system will allow Microsoft Surface UEFI Manager to install the required assemblies for SEMM even if a user is not logged on to the Surface device. Click Next to proceed. Summary – The information that was parsed in the Import Information step and your selections from the General Information step is displayed on this page. Click Next to confirm your selections and create the application. Progress – Displays a progress bar and status as the application is imported and added to the Software Library. Completion – Confirmation of the successful application creation is displayed when the application creation process is complete. Click Close to finish the Create Application Wizard. After the application is created in Configuration Manager, you can distribute it to your distribution points and deploy it to the collections including your Surface devices. This application will not install or enable SEMM on the Surface device – it only provides the assemblies required for SEMM to be enabled via PowerShell script. If you do not want to install the Microsoft Surface UEFI Manager assemblies on devices that will not be managed with SEMM, you can configure Microsoft Surface UEFI Manager as a dependency of the SEMM Configuration Manager scripts. 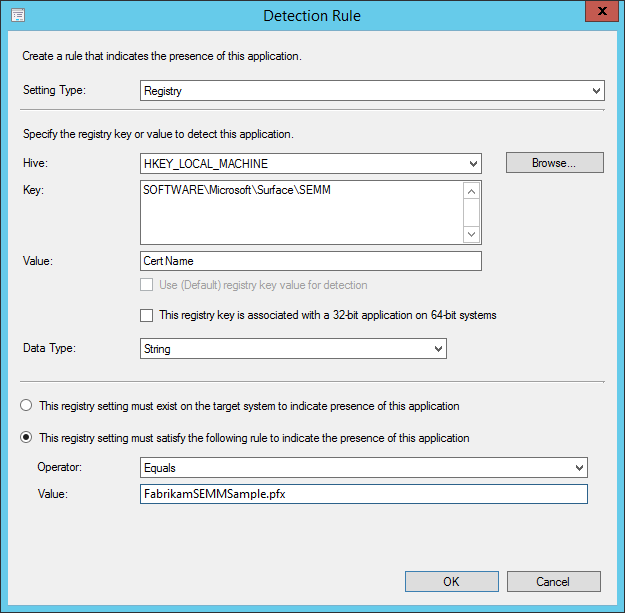 This scenario is covered in the Deploy SEMM Configuration Manager Scripts section later in this article. After the required assemblies have been installed on the devices, the process of enrolling the devices in SEMM and configuring Surface UEFI is done with PowerShell scripts and deployed as a script application with Configuration Manager. These scripts can be modified to fit the needs of your organization and environment. For example, you can create multiple configurations for managed Surface devices in different departments or roles. You can download samples of the scripts for SEMM and Configuration Manager at the link in the Prerequisites section at the beginning of this article. ConfigureSEMM.ps1 – Use this script to create configuration packages for your Surface devices with your desired Surface UEFI settings, to apply the specified settings to a Surface device, to enroll the device in SEMM, and to set a registry key used to identify the enrollment of the device in SEMM. ResetSEMM.ps1 – Use this script to reset SEMM on a Surface device, which unenrolls it from SEMM and removes the control over Surface UEFI settings. The sample scripts include examples of how to set Surface UEFI settings and how to control permissions to those settings. These settings can be modified to secure Surface UEFI and set Surface UEFI settings according to the needs of your environment. The following sections of this article explain the ConfigureSEMM.ps1 script and explore the modifications you need to make to the script to fit your requirements. The SEMM Configuration Manager scripts and the exported SEMM certificate file (.pfx) should be placed in the same folder with no other files before they are added to Configuration Manager. 62    $privateOwnerKey = Join-Path -Path $packageRoot -ChildPath "FabrikamOwnerSigner.pfx"
63    $ownerPackageName = Join-Path -Path $packageRoot -ChildPath "FabrikamSignerProvisioningPackage.pkg"
64    $resetPackageName = Join-Path -Path $packageRoot -ChildPath "FabrikamUniversalResetPackage.pkg"
66    # If your PFX file requires a password then it can be set here, otherwise use a blank string. Replace the FabrikamOwnerSigner.pfx value for the $privateOwnerKey variable with the name of your SEMM Certificate file on both lines 60 and 62. The script will create a working directory (named Config) in the folder where your scripts are located, and will then copy the certificate file to this working directory. Replace the FabrikamSignerProvisioningPackage.pkg and FabrikamUniversalResetPackage.pkg values on lines 63 and 64 to define the $ownerPackageName and $resetPackageName variables with your desired names for the SEMM configuration and reset packages. These packages will also be created in the Config directory and hold the configuration for Surface UEFI settings and permissions generated by the script. On line 67, replace the value of the $password variable, from 1234, to the password for your certificate file. If a password is not required, delete the 1234 text. 144 # Device owners will need the last two characters of the thumbprint to accept SEMM ownership. 145 # For convenience we get the thumbprint here and present to the user. The SEMM certificate name and password must also be entered in this section of the ResetSEMM.ps1 script to enable Configuration Manager to remove SEMM from the device with the uninstall action. 209 #     can delegate permission control for some settings. 228 # Create a unique package name based on family and LSV. 229 # We will choose a name that can be parsed by later scripts. 230 $packageName = $uefiV2.SurfaceUefiFamily + "^Permissions^" + $lsv + ".pkg"
233 # Build and sign the Permission package then save it to a file. $ownerOnly – Permission to modify this setting is granted only to SEMM. $ownerAndLocalUser – Permission to modify this setting is granted to a local user booting to Surface UEFI, as well as to SEMM. You can find information about the available settings names and IDs for Surface UEFI in the Settings Names and IDs section of this article. 284 # In this demo, we will start by setting every setting to the default factory setting. 286 # so that every setting gets set to a known state. 292 # here are examples of how to accomplish this. 293 $uefiV2.Settings["IPv6 for PXE Boot"].ConfiguredValue = "Disabled"
297 # is supplied to do this explicitly. 299 # even after we initially set it to factory default above. 302 # Create a unique package name based on family and LSV. 303 # We will choose a name that can be parsed by later scripts. 304 $packageName = $uefiV2.SurfaceUefiFamily + "^Settings^" + $lsv + ".pkg"
307 # Build and sign the Settings package then save it to a file. Like the permissions set in the Configure Permissions section of the script, the configuration of each Surface UEFI setting is performed by defining the $uefiV2 variable. For each line defining the $uefiV2 variable, a Surface UEFI setting is identified by setting name or ID and the configured value is set to Enabled or Disabled. If you do not want to alter the configuration of a Surface UEFI setting, for example to ensure that the Surface UEFI administrator password is not cleared by the action of resetting all Surface UEFI settings to their default, you can use ClearConfiguredValue() to enforce that this setting will not be altered. In the sample script, this is used on line 300 to prevent the clearing of the Surface UEFI Administrator password, identified in the sample script by its setting ID, 501. You can find information about the available settings names and IDs for Surface UEFI in the Settings Names and IDs section later in this article. The computer where ShowSettingsOptions.ps1 is run must have Microsoft Surface UEFI Manager installed, but the script does not require a Surface device. Start the Create Application Wizard using Step 1 through Step 5 from the Deploy Microsoft Surface UEFI Manager section earlier in this article. General – Select Manually specify the application information, and then click Next. General Information – Enter a name for the application (for example SEMM) and any other information you want such as publisher, version, or comments on this page. Click Next to proceed. Application Catalog – The fields on this page can be left with their default values. Click Next. 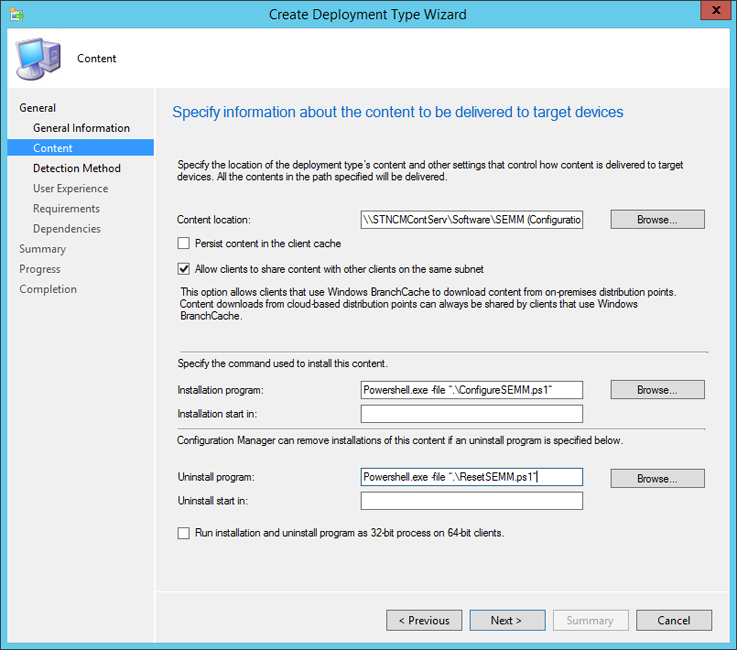 Deployment Types – Click Add to start the Create Deployment Type Wizard. General – Click Script Installer from the Type drop-down menu. The Manually specify the deployment type information option will automatically be selected. Click Next to proceed. General Information – Enter a name for the deployment type (for example SEMM Configuration Scripts), and then click Next to continue. Content – Click Browse next to the Content Location field, and then click the folder where your SEMM Configuration Manager scripts are located. In the Installation Program field, type the installation command found earlier in this article. In the Uninstall Program field, enter the uninstallation command found earlier in this article (shown in Figure 2). Click Next to move to the next page. Click Registry from the Setting Type drop-down menu. Click HKEY_LOCAL_MACHINE from the Hive drop-down menu. Enter SOFTWARE\Microsoft\Surface\SEMM in the Key field. Enter Enabled_Version1000 in the Value field. Click String from the Data Type drop-down menu. Click the This registry setting must satisfy the following rule to indicate the presence of this application button. Enter 1 in the Value field. Click OK to close the Detection Rule window. User Experience – Click Install for system from the Installation Behavior drop-down menu. If you want your users to record and enter the certificate thumbprint themselves, leave the logon requirement set to Only when a user is logged on. If you want your administrators to enter the thumbprint for users and the users do not need to see the thumbprint, click Whether or not a user is logged on from the Logon Requirement drop-down menu. Requirements – The ConfigureSEMM.ps1 script automatically verifies that the device is a Surface device before attempting to enable SEMM. However, if you intend to deploy this script application to a collection with devices other than those to be managed with SEMM, you could add requirements here to ensure this application would run only on Surface devices or devices you intend to manage with SEMM. Click Next to continue. Dependencies – Click Add to open the Add Dependency window. Click Add to open the Specify Required Application window. Enter a name for the SEMM dependencies in the Dependency Group Name field (for example, SEMM Assemblies). Click Microsoft Surface UEFI Manager from the list of Available Applications and the MSI deployment type, and then click OK to close the Specify Required Application window. Keep the Auto Install check box selected if you want Microsoft Surface UEFI Manager installed automatically on devices when you attempt to enable SEMM with the Configuration Manager scripts. Click OK to close the Add Dependency window. Summary – The information you have entered throughout the Create Deployment Type wizard is displayed on this page. Click Next to confirm your selections. Progress – A progress bar and status as the deployment type is added for the SEMM script application is displayed on this page. Completion – Confirmation of the deployment type creation is displayed when the process is complete. Click Close to finish the Create Deployment Type Wizard. Summary – The information that you entered throughout the Create Application Wizard is displayed. Click Next to create the application. Progress – A progress bar and status as the application is added to the Software Library is displayed on this page. After the script application is available in the Software Library of Configuration Manager, you can distribute and deploy SEMM using the scripts you prepared to devices or collections. If you have configured the Microsoft Surface UEFI Manager assemblies as a dependency that will be automatically installed, you can deploy SEMM in a single step. If you have not configured the assemblies as a dependency, they must be installed on the devices you intend to manage before you enable SEMM. When you deploy SEMM using this script application and with a configuration that is visible to the end user, the PowerShell script will start and the thumbprint for the certificate will be displayed by the PowerShell window. You can have your users record this thumbprint and enter it when prompted by Surface UEFI after the device reboots. Alternatively, you can configure the application installation to reboot automatically and to install invisibly to the user – in this scenario, a technician will be required to enter the thumbprint on each device as it reboots. Any technician with access to the certificate file can read the thumbprint by viewing the certificate with CertMgr. Instructions for viewing the thumbprint with CertMgr are in the Create or modify the SEMM Configuration Manager scripts section of this article. Removal of SEMM from a device deployed with Configuration Manager using these scripts is as easy as uninstalling the application with Configuration Manager. This action starts the ResetSEMM.ps1 script and properly unenrolls the device with the same certificate file that was used during the deployment of SEMM. Microsoft Surface recommends that you create reset packages only when you need to unenroll a device. These reset packages are typically valid for only one device, identified by its serial number. You can, however, create a universal reset package that would work for any device enrolled in SEMM with this certificate. We strongly recommend that you protect your universal reset package as carefully as the certificate you used to enroll devices in SEMM. Please remember that – just like the certificate itself – this universal reset package can be used to unenroll any of your organization’s Surface devices from SEMM. When you install a reset package, the Lowest Supported Value (LSV) is reset to a value of 1. You can reenroll a device by using an existing configuration package – the device will prompt for the certificate thumbprint before ownership is taken. For this reason, the reenrollment of a device in SEMM would require a new package to be created and installed on that device. Because this action is a new enrollment and not a change in configuration on a device already enrolled in SEMM, the device will prompt for the certificate thumbprint before ownership is taken.